This is an interesting Project Sanctuary story on many different levels, created by PS Master Margreet Vink from Holland. 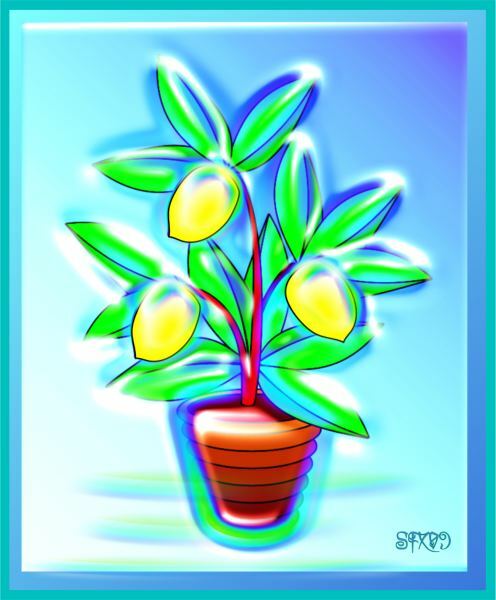 Margreet was given a "The Gift" - a lemon tree in a pot by StarFields aka Silvia Hartmann - at one time. But rather than just saying "Thank you, that's neat!" as we usually do with The Gifts, Margreet took the The Gift of the lemon tree into her sanctuary and planted it there. I was given a lemon tree by StarFields. I immediately liked the idea and I took it and went to find the perfect place for it in my sanctuary. I came to an orchard where there was already a hole made to plant it and there were people expectantly waiting for it. There, I planted it with the help of the owner of the orchard and not much later we went to sleep because it was already quite late. The next morning it already was fruit bearing and I picked one of the beautiful lemons and I cut it in two. Inside, there were the seeds and they weren’t the usual seeds you would expect in a lemon, their shape made me think of a massage device, a bit like the image here, but then still a bit other. Anyway, the seeds looked like small crystals with a shape that reminded me of this. I instantly knew that these seeds were important and I knew too that one of these seeds needed to be planted in order to grow new trees. All the people present looked at me expectantly what I would do. So I explained that to me those seeds where important and that you could use them for all kind of things, for luck, for potions, for medicine, and for a lot more. I gave everyone a lemon and told them to plant one of the seeds. They laughed and said they already knew this. It felt like it was part of their DNA or something, the minute I arrived with the tree they knew they had been waiting for this. In fact the hole was already there to plant it. I felt grateful to be the giver of such good things - this was a real gift! I also took and planted the first seed and it started to grow immediately. It is not very big as yet, but you can tell that next year there would be a tree again. I smiled at the owner of the orchard and we decided to make lemonade (how appropriate) and lemon liqueur and when this was finished there would be a party where everybody would give thanks to the lemon tree. I stayed there for a while, used it as a sleep habitat and it felt so peaceful. I didn’t know the place before, but it is quite close to where I live in my main Sanctuary; I just never went this way. I know I have found new friends and I took a seed to plant it in my garden. I took a few more to grow them and give them away but only one of them really grow out to be a tree yet and this one I give to you as a birthday present. I know this story doesn’t sound so Sanctuary anymore, but I went through this story a few months ago, just never wrote it down. I can tell you that the emotion was there, both from me and from the people who lived in the orchard and the surrounding places. I could really feel the excitement when I planted the tree and the same the next day as I cut the first lemon in two. I still remember very vividly feeling very surprised as I first saw the crystal, massage tool like shaped seeds and I knew instantly that they were special in many ways and that one of every fruit needed to be planted. And everybody agreed on that. So thanks for inventing Project Sanctuary, otherwise I would just have accepted your gift and would not have brought it to a place where it was needed. And thank you even more for teaching me how to do and use PS through the Master course. I love it! So I hope you are happy with another lemon tree as a birthday gift. You probably already knew about its seeds and the uses and if not then I probably was the intermediary that was needed for you to know about it. thank you so much for the next generation lemon tree. I asked for "the perfect place in time and space" to plant it and found myself in a place where I have often been, a wide sweeping plane of green grass and blue skies, with the shores of an ocean to the east. There is very little here but all is full of resonant potential; and I sometimes walk on the sands and in the grassy hills for that sense of freedom and space that exists here. I've often wondered about this place and what I should do here, but never came to any conclusion; today I'm here with my next generation lemon tree. As I'm carrying it and walking deeper into the grasslands, towards the north-west, I am becoming aware that it isn't completely a lemon tree any longer; it is more abstract although it still holds the shape and you can tell what its parent was. It has an interesting mix of fresh, spring green energy and yellow energy with sparks of rainbows around the edges; and neither of these colours exist here as yet, and I feel the land is holding its breath and awaiting this gift with some excitement, and interest. I keep on walking until I see what might be described as a watering hole - here, some water has come to the surface, enough to make a small pond. I think the tree might like it here, not too close but close enough so it can get plenty of water which seems to be welling up from a deep, clear lake beneath the surface. As I'm walking around the pond, the tree in my arms is becoming strangely magnetic - pushing away from where it doesn't want to be, and being drawn towards where it wants to be planted. A very specific place at a very specific distance from the pond, on its northern side, becomes apparent, and here, the magnetic pull is so strong that as I release the tree, it gets immediately sucked into the ground as though the land is welcoming it with open arms. I'm glad no digging was required! As I stand and watch, I can feel the roots stretching out beneath my feet, the earth is vibrating and the tree itself is shuddering, coming to life, connecting up with the land and now the branches and leaves reach up to connect with the sky. Here I notice now that the yellow of the "lemons" (they are no such thing!) is a perfect reflection of the yellow of the sun which is directly above my head, as the leaves are a perfect reflection of the green of the grass - a reflection, a resonance, not at all the same colour. The tree is starting to stretch, to reach and grow, and as it does so, it becomes ever more unlike a tree and ever more like a kind of fountain, a radiance, some kind of field that holds within it the idea of many different kinds of trees, plants, and flowers - this is the idea of a garden, perhaps of a tropical rainforest, coming to life here in this landscape. As it expands and shifts more and more into being a vibrant energy absolute, I can feel it beginning to change the entire landscape at the very deepest level of existence, giving this land new ideas, and these new ideas will be expressed in new seeds and new plants, and even as I watch it I know that the ideas will evolve and eventually become animals of many different kinds, colourful and divergent, and even the idea of new beings is being presupposed here. This is quite extraordinary; a delicious, vibrant genesis is taking place here, and then I also notice that the land itself, the grassland, has its own ideas which are becoming manifest here and are shaping and changing things in their own image. 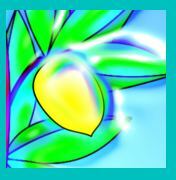 When the entire world has become merged with the energy fountain that was the original lemon tree, it has gone at that level - but at that level, I can see a strange shimmer in the grass, and as I look more closely, I can see many, many different new plants beginning to emerge. I won't recognise this land when next I come here. I whistle to myself in pleasure and float myself back towards the ocean shore (I don't want to step on any of the young seedlings trying to emerge!) and there, too, I can tell that this ocean now has life beginning to emerge, and I sit on the sand with the land behind me, the ocean before me, and the lemon yellow sun, still directly above.